Netflix fell short of its subscriber growth expectations in the second quarter, causing its share price to tumble 14% in after hours trading. The streaming video giant signed up 5.2 million new members in Q2, which was roughly flat year-on-year but lower than its growth forecast of 6.2 million new members. “We had a strong but not stellar Q2, ending with 130 million memberships,” said the company in its letter to shareholders, pointing out that earnings, margins, and revenue were all in-line with forecast and “way up from prior year”. However, on top of lower-than expected sign-ups for the current quarter, Netflix also forecast a year-on-year decline in net additions for the third quarter. In the US in Q2 Netflix added 0.7 million users, compared to a guidance of 1.2 million and down on the 1.1 million it signed up in Q2 2017. Internationally it added 4.5 million members in Q2, compared to a guidance of 5.0 million but above the 4.1 million it added during the same period last year. 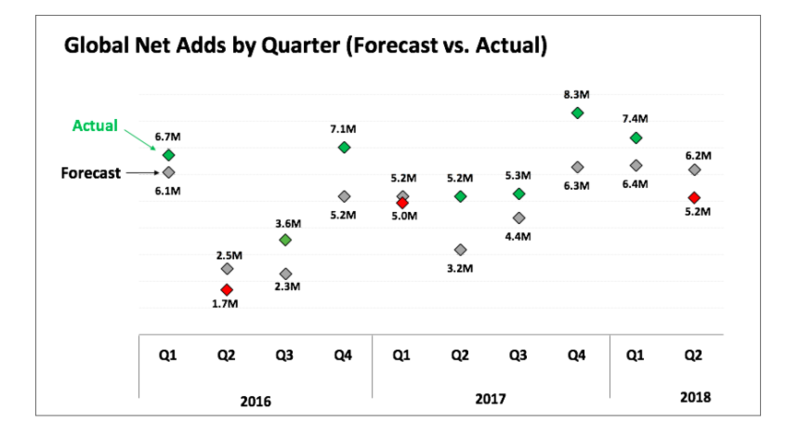 For the current quarter, Netflix forecast global net additions of 5.0m compared with 5.3m in Q3 2017. It expects 0.65 million of these new Q3 members to be in the US and 4.35m to be international. “As a reminder, the quarterly guidance we provide is our actual internal forecast at the time we report and we strive for accuracy, meaning in some quarters we will be high and other quarters low relative to our guidance,” said Netflix. 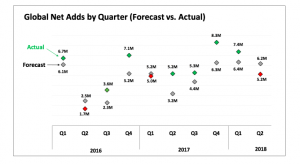 A chart included in its letter to shareholders illustrated that in seven of the past 10 quarters – spanning Q1 2016 to Q2 2018 – Netflix has beaten its global net addition forecast on seven occasions and missed on three. The company’s streaming revenue in Q2 rose 43% year-on-year to US$3.8 billion, driven by a 26% and 14% increase in average paid memberships and average selling price respectively. Consolidated EBITDA was US$563, almost triple its value a year earlier. Free cash flow in Q2 was -US$559 million compared to -US$608 million a year earlier. Netflix said it continues to anticipate free cash flow of -US$3 to -US$4 billion for the full year 2018, which implies that its content cash spending will be weighted to the second half of 2018. “Our broad slate of programming in Q2 highlights the diversity of programming we are providing,” said Netflix in its shareholders letter, citing shows like Lost in Space, 13 Reasons Why, Santa Clarita Diet and Marvel’s Jessica Jones. The company also said that with the growth of its content production in 80 countries and expanding, it plans to move more of its operating costs to non-US dollar to provide “a little more natural hedging”.